The anterior cruciate ligament (ACL) is one of a pair of ligaments in the center of the knee joint that form a cross, and this is where the name "cruciate" comes from. 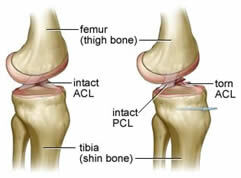 There is both an anterior and a posterior cruciate ligament (PCL). Both of these ligaments function to stabilize your knee from front-to-back. In medical terms, the ACL is the primary restraint to anterior displacement of the tibia on the femur. Translation in plain English, that when the ACL is injured or torn the shinbone can then slide forward on the thighbone, causing the knee to become unstable and “give way”. ACL surgery begins with an arthroscopic examination of the inside of your knee. Arthroscopic surgery has revolutionized the process of ACL reconstruction (and orthopedic sports medicine in general). This surgical technique uses three very small incisions that are about 1/4 of an inch in length to create viewing access into the knee. A fiber-optic light source lights the inside of the knee and a video camera sends an image to a monitor so that the surgeon can see inside the knee. A sterile saline solution is continuously pumped through the knee so that the surgeons vision field is always clear. During arthroscopic knee surgery, the surgeons maneuver their tools by watching the image (provided by the arthroscope) displayed on a video monitor. Your surgeon will inspect the knee for damage to the cartilage or the menisci, the remnants of the torn ACL are removed with a shaver. This tool is a special device that is used to remove torn ligaments or torn pieces of cartilage from the knee. The surface of the intercondylar notch where the ACL normally attaches to the femur is then prepared with a high-speed burr so that the proper location for the tunnel. Tunnels are then drilled through the bone in the femur and the tibia so that the graft can be placed in the center of the knee in the same position as the original ACL. A separate incision that is about 2 to 3 inches long also has to be made in order to harvest the graft from either the patellar tendon or the hamstring tendons. After the graft has been harvested, it is then prepared by placing several very strong surgical sutures through the graft that are used to fix it in place. After the graft is passed through the tunnels, it is then tightened and fixed into place. A variety of fixation techniques have been developed to anchor the graft to the bone. Different techniques are used for different types of grafts, and today, fixation failures, though possible, are very rare. Once the graft has been fixed in place and any additional damage has been addressed, the incisions are closed and a sterile dressing is used to cover the knee. This dressing will remain on for several days. 1. How can I tell if I have a torn ACL? 2. Should I get an allograft or autograft? 3. What is the function of the anterior cruciate ligament (ACL)? 4. How are ACL tears diagnosed? 5. If my ACL is torn, should I have ACL surgery to repair it? 6. What is the success rate of the surgery? 7. Are the differences in ACL technique important? 8. Is one type of ACL reconstruction stronger than the other? 9. Are there more side effects from one type of reconstruction? 10. How can I decide whether a hamstring or patella tendon reconstruction would be better for me? Who will make the decision? 11. How long is the ACL procedure? 12. Do the screws holding the graft in place need to be removed? 13. Can ACL tears happen again? 14. If I use a brace, should I buy a custom brace or over-the-counter brace? 15. How long will I be on crutches? 16. How much time off from work should I take? 17. When will I be able to drive? 18. How big will the incision be on my knee? 19. How many incisions will there be? 20. Is severe bruising normal? 21. How long will it take to return to sports? Sometimes it's tough to tell. Even for the doctors. When you tear your ACL it feels a lot "looser" than your good knee. It almost feels like it could pop out of place at any minute. The stability just isn't there. When some people tear their ACL, they hear a "pop" when it happens. It's usually pretty loud and noticeable. If you have a torn ACL it also usually swells up immediately... the pain isn't always severe, but swelling is a tell-tale sign. Your knee will also go out of place pretty easily. This is something you need to discuss with your surgeon. As a rule of thumb, most doctors will tell you to go with autograft. 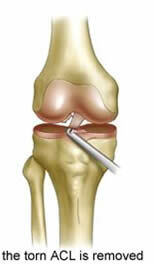 An autograft means the tissue being used for your new ACL will come from your own body. Most often this is either the patellar tendon (the tendon that attaches your kneecap to your tibia) or the hamstring. An allograft means the tissue for your new ACL will come from someone else. Cadavers are used for this. Don't let that scare you off though, this method is safe and works well. The tissue taken from the cadaver isn't "living" tissue, so there is almost no chance of contracting any sort of disease or virus. It's NOT the same thing as having a organ transplant. You won't have to take any drugs that suppress your immune system like you would for a organ transplant. And since it isn't "living" tissue, there isn't a problem with your body "rejecting" the new ACL. There is generally less pain involved when having an allograft. Since you won't be harvesting tissue from your own patellar tendon or hamstring, the pain will be minimal. That is one of the major advantages of an allograft. An allograft isn't considered to be quite as strong as an autograft, but close. Recovery time is also a little bit quicker. Allografts are also used most of the time if you have had a previous ACL reconstruction. Autografts are used in the majority of first time ACL reconstructions. They tend to be strong, but also result in a little more pain than the allograft. However, the pain isn't overwhelming by any means, so this fact alone shouldn't be a major deciding factor. 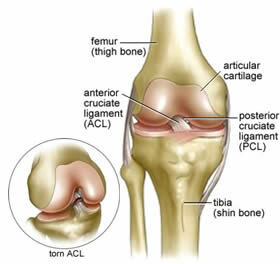 The ACL is the most important structure in the knee for providing stability during sports and physical activities and any physical movement which involves the changing of direction while moving at speed.If the knee is unstable, cartilage wear & tear occurs at a much faster rate than normal which can lead to arthritis of the knee joint. An ACL tear is one of the commonest serious injuries in spots today. Most ACL tears can be detected manually as the knee joint will generally show abnormal movements when moved. There is a variation in the normal range of these tests so the amount of movement is compared with your other knee. Sometimes these tests can be inconclusive immediately after an injury, due to excessive swelling. If physical inspection is inconclusive, a special test called an MRI (Magnetic Resonance Imaging) Scan can be performed. As a general rule, the body cannot repair a torn ACL if the tear is complete. Partial tears may sometimes heal but often will continue to deteriorate into becoming complete tears. If surgery is needed, the surgeon will not repair the ligament directly, as this has a low success rate, but will instead use a nearby tendon,( hamstring or patella) to reconstruct the original ligament. (1) Your future demands in lifestyle and sports. For example, a professional soccer player would be strongly advised to have an ACL reconstruction whereas a 55 year old sedentary person might not. It depends on your level of activity. If you like to ski or hike for example, than you should have the surgery. (2) The amount of instability in the knee. A knee that has strongly positive features of ACL instability on examination or is giving way on daily activities will almost certainly require surgery, but a knee that is relatively stable may survive without surgery. The ACL is the most commonly reconstructed ligament in the body, although the surgical techniques to perform this operation have only been developed over the last 20 years. Experienced knee surgeons will claim a success rate for this operation of 85-90%. However, success should only be judged by the long-term stability and lack of pain in a knee. Because it is very difficult to follow patients over a long period of time and also that virtually every surgeon uses a different technique, the exact success rates for various surgeons are not known. Most failures involve reinjury to the structures in the knee. Complications such as infection and venous thrombosis after surgery can occur but are very rare. The answer is yes. Most doctors would agree that ACL reconstruction surgery is very technically demanding and will recommend a surgeon who has successfully returned top level athletes to their sport. ( Note SSI's surgeon Dr. Mazzoca is the sports doctor and surgeon for the Venezuelan International soccer team.) Therefore, the odds of a successful outcome will be less if the operation was performed by an inexperienced surgeon in a public hospital. One major difference in technique between experienced surgeons is in choice of tissue to replace the ligament. Some surgeons use a segment of the patella tendon from the front of the knee, whereas others use a combination of hamstring tendons from the inside of the back of the knee. It is not well established that either technique is universally better than the other. This has not proven either way, although evidence from studies in which the different types of reconstructions are compared generally favors the patella tendon technique. A recent randomized control trial in the American Journal of Sports Medicine found the patellar tendon technique to result in a more stable knee. The theory as to why the reconstruction may be stronger is that the patellar tendon is connected to bone at either end; it can be fixed inside the knee (bone fixed to bone) more firmly than the hamstring tendons (tendon fixed to bone). However, the thickness of the patellar and hamstring tendons themselves, which are obviously important for strength of the graft, also vary significantly between patients, so it may not be the case in all individuals that the patellar tendon reconstruction is stronger. Your surgeon will be the best judge of this. The site of graft tissue taken can give rise to symptoms, either in the patella tendon or hamstrings, although these are generally more significant with the patella tendon. Side effects such as pain on kneeling and squatting appear to be more common with the patella tendon technique. In general, length of hospital stay, the pain and size of scar are all less with the hamstring tendon technique. The decision will be made by the surgeon. Your surgeon will have a preferred technique which they recommend to most people based on their experience. Some surgeons will offer both technique. Approximately 1- 1/2 to 2 hours. You will spend approximately 2 hours in the Recovery Room after surgery. Both the patella tendon and hamstring grafts, use two bio absorbable screws in your knee to hold the graft in place. They are set deep in your bone and cannot be felt. They do not need to be removed. It will take approximately two to three years for them to be fully absorbed. This slow absorption is not a problem since the ends of the graft are fully incorporated into the bone tunnels within two to three months. Yes it can and does. ACL injury is associated with multidirectional sport (football, soccer, basketball, and skiing particularly), so stopping these sports is a way to prevent injury, but often not acceptable to athletes or very active people. The source of injury is often getting your foot caught on the ground while the body moves in another direction. In football, wearing boots with shorter cleats helps prevent the foot getting caught in the turf. In all sports, a stabilizing knee brace may offer some protection. However, there is no sure way to prevent re injury. A custom brace is always the best fit. It can be fitted to you specifically. No "over-the-counter" brace will ever be as secure, hence as safe. In certain situations (like football) braces can serve a useful purpose. They do protect the knee from direct contact. But any other sport, they don't do much for. Almost always, it's the twisting action that tears your ACL and no brace can prevent that. Between 1 and 2 weeks unless otherwise instructed by your surgeon. When you gain muscle control of your leg and feel secure, you can discontinue the crutches. One to two weeks for a desk-type job. Up to three months for moderately physical work and up to six months for strenuous physical work. You will be able to drive when you have discontinued: (1) pain medication, (2) the use of crutches, and have gained (3) good control of the knee that was reconstructed. This usually takes about two weeks, although patients having left knee surgery may be able to drive an automatic within one week or so. Approximately 3 to 4 inches long on the front of your knee for patella tendon grafts and 1 1/2-2 inches long on the inside front of your knee for hamstring grafts. In addition to the incision on the front of your knee, there may be a 1/4-inch arthroscopic entry scar and another 1/8-inch drain exit wound above the knee. Absolutely, the bruising is normal and will vary a lot from person to person. Some bruising looks terrible. Most of the severe bruising will subside after a couple weeks. Everyone recovers at a different rate. The typical answer that you will hear from most surgeons is six months. It's possible to return sooner than six months, but the risks for re-injury are higher. It takes about 12-18 months for your new ACL to be in maximum condition. At six months, it is about 80-85%, this is generally considered to be strong enough to return to sports and heavy physical activity.